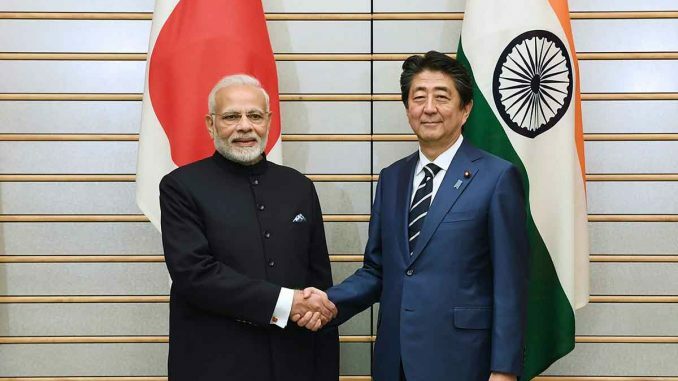 The deepening relationship between Japan and India serves the goal of forestalling the emergence of a China-centric Asia. If they can leverage their relationship to generate progress toward broader cooperation among the region’s democracies, the vision of a free and open Indo-Pacific may be achievable. On his week-long tour of Asia, US Vice President Mike Pence has been promoting a vision of a “free and open” Indo-Pacific region, characterized by unimpeded trade flows, freedom of navigation, and respect for the rule of law, national sovereignty, and existing frontiers. The question is whether this vision of an Indo-Pacific free of “authoritarianism and aggression” is achievable. One country that seems willing to contribute to realizing this vision is Japan. In fact, Japanese Prime Minister Shinzo Abe is the originator of the “free and open Indo-Pacific” concept that lies at the heart of President Donald Trump’s new strategy, the successor to Barack Obama’s unhinged “pivot” to Asia. Having historically punched above its weight internationally, Japan is responding to China’s muscular rise by strengthening its own position in the region. Taking advantage of its considerable assets – the world’s third-largest economy, substantial high-tech skills, and a military that has recently been freed of some legal and constitutional constraints – Japan is boosting its geopolitical clout. But creating a free and open Indo-Pacific is not the job of one country alone. Establishing the stable balance of power needed to realize Pence’s vision will require all of the region’s major democracies – from Japan and India to Indonesia and Australia – to come together. With that in mind, Abe and his Indian counterpart, Narendra Modi, recently held a summit that opened the way for a military logistics pact that would give each country’s armed forces access to the other’s bases. Beyond instituting a joint “two plus two” dialogue among the countries’ foreign and defense ministers, Abe and Modi agreed to deepen naval and maritime-security cooperation and collaborate on projects in third countries, including Myanmar, Bangladesh, and Sri Lanka, to enhance strategic connectivity in the Indo-Pacific. At the summit, Japan and India devised a new motto for the bilateral relationship: “Shared security, shared prosperity, and shared destiny.” The comfort and camaraderie shown by Abe and Modi during their meeting, held at Abe’s private vacation home near Mount Fuji, stood in stark contrast to the stony expressions and somber handshakes on display when, just two days earlier, Abe had met Chinese President Xi Jinping in Beijing. Cooperation between India and Japan builds on, among other things, the trilateral India-Japan-US “Malabar” naval exercises. Malabar has become an important component of the effort to defend freedom of navigation and overflight in the Indo-Pacific region, through which two-thirds of global trade travels. If India signed a military logistics agreement with Japan, as it has with the US, the Indian navy would be better able to expand its footprint to the western Pacific, while enabling Japan to project its naval power in the Indian Ocean. Fortunately, relations among the Indo-Pacific’s four key maritime democracies – Australia, India, Japan, and the US – are stronger than ever, characterized by high-level linkages and intelligence-sharing. These countries should institutionalize their “quad” initiative, with the India-Japan dyad forming the cornerstone of efforts to pursue wider collaboration in the region. But such collaboration will face considerable obstacles. For starters, the relationship between Japan and America’s other closest East Asian ally, South Korea, continues to be held hostage by history. The issue of “comfort women,” Korean women who were coerced into providing sexual services to Japanese troops during World War II, has long been particularly contentious. A 2015 agreement, endorsed by Abe and former South Korean President Park Geun-hye, claimed to resolve the issue “irreversibly”: Japan offered its apology and one billion yen ($8.8 million) for a fund created to help the victims. But, earlier this year, Park’s successor, Moon Jae-in, rejected the deal, arguing that it did not adequately serve the victims or the public. More recently, South Korea’s Supreme Court ordered a major Japanese steelmaker to compensate the “victims of forced labor” during Japan’s colonial rule of Korea, even though a 1965 bilateral agreement was supposed to have settled “completely and finally” all such claims. The rancorous relationship between Japan and South Korea plays directly into China’s hands. While South Korea obviously should not disregard its history, it should find a way to move past its colonial subjugation and form new, mutually beneficial relationships with Japan, much as India, Taiwan, the Philippines, and Indonesia have done with their former colonizers. Another potential impediment to a concert of Indo-Pacific democracies is domestic instability in key countries. In strategically located Sri Lanka, for example, President Maithripala Sirisena has ousted Prime Minister Ranil Wickremesinghe (despite the latter’s parliamentary majority) and called a snap election, even though the constitution does not give him the power to do either. A weakening of the country’s democracy could have strategic ramifications for an economically integrated but politically divided Indo-Pacific. Nonetheless, the deepening relationship between Japan and India serves the goal of forestalling the emergence of a China-centric Asia. If Japan and India – after China, the region’s most influential countries – can leverage their relationship to generate progress toward a broader concert of democracies in the region, the vision of a free and open Indo-Pacific may be achievable after all.